Belmont was again well represented at the 37th Annual Lilly Conference on College Teaching this November at Miami University in Oxford, Ohio. 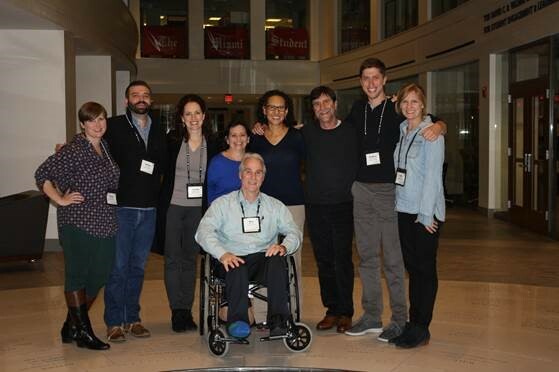 Ten Belmont faculty members–from the College of Liberal Arts and Social Sciences, the College of Science and Mathematics, the College of Health Sciences and Nursing and the College of Visual and Performing Arts–were among the 550 conference participants. The Lilly Conference is one of the nation’s leading conference venues for the presentation of the scholarship of teaching and learning (SoTL). Faculty scholars of teaching and learning from across the United States and several international educational institutions share innovative pedagogies and have vibrant discussions about questions and challenges associated with teaching and learning. Belmont faculty members contributed three presentations at the 2017 Lilly Conference. “The Elephant in the Classroom: Addressing Sensitive Topics With Skill and Courage,” presented by Associate professor of Social Work Julie Hunt and Assistant Professor of Sport Science Dr. Marnie Vanden Noven, explored the teacher’s role in fostering an environment where students are safe to discuss taboo topics in meaningful, productive and potentially transformative ways. The session discussion included strategies for creating a safe space in the classroom, tuning in to individual students and class responses and the use of narratives. Professor of Psychological Science Dr. Pete Giordano and Professor of Mathematics Dr. Mike Pinter, who also serves as director of the Teaching Center, presented “Asking Questions About My Teaching: A Vehicle for Continuous Improvement.” In addition to sharing questions that they routinely ask about their own teaching as a means to continually improve their craft of teaching, session participants were invited to generate ideas for their own questions. The questions presented by Giordano and Pinter included topics associated with flexibility, ethical issues, diversity and student development. Professor of Biology Dr. Jennifer Thomas contributed a presentation entitled “A Strategic and Multi-Level Approach for Teaching Undergraduates How to Read Primary Literature in the Sciences.” Based on the observation that reading scientific articles can be a daunting exercise for undergraduate students, the session provided strategies for the dissection of articles so that students can gain confidence in how to read a paper, regardless of the research. In addition to including strategies she has developed to help students build these skills, Thomas guided participants through the process of applying the techniques to their courses.